For more than 40 years the Volkswagen Jetta has been the choice for a sophisticated and fun to drive sedan. The 2019 Jetta is no exception. This seventh generation Jetta has more room, comfort, technology, and value than previous years. The Jetta is now based on Volkswagen’s current scalable architecture that underpins many of the brand's models, from the Golf to the Atlas three-row SUV, which helps VW reduce costs through shared development and production. Consumers will see a drop for the base model price and a list of features that has expanded compared with the outgoing Jetta. The 2019 Jetta features a turbocharged four-cylinder engine with plenty of power coupled with an eight-speed automatic transmission. There is a six-speed manual transmission option for those seeking a sportier drive. Even with the performance gains, the Jetta achieves a combined 34mpgs. A comfortable ride is achieved by a compliant suspension system that absorbs bumps and imperfections in the road to perfection. This makes for a quiet ride while maintaining a sporty feel. Interior features like automatic climate control, front heated seats, sunroof, and the soft-touch upper dash gives the Jetta an interior ambience edge over most of its competitors. There are plenty of storage places, including a bin under the nicely padded armrest that can accommodate an iPad mini, as well as generous pockets built into the doors for water bottles, umbrellas, and whatnot. All Jettas will come with Android Auto and Apple CarPlay compatibility standard. 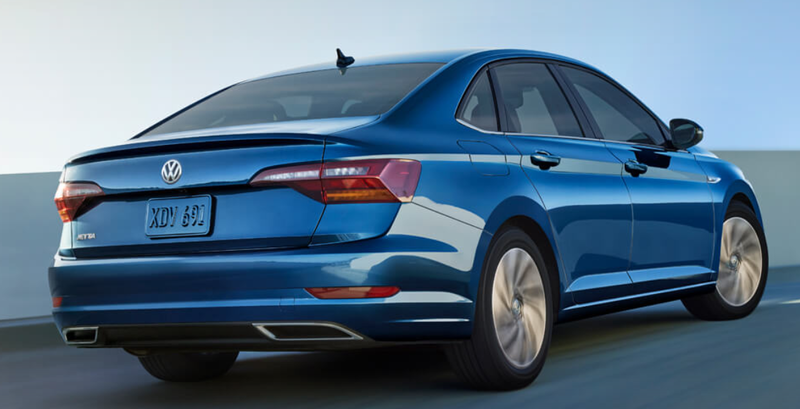 We suggest making the short drive to the Olympia Auto Mall and taking a test drive in the 2019 Jetta. The friendly staff at Volkswagen of Olympia will be happy to answer all your questions and get you behind the wheel of this proven sedan. We look forward to seeing you soon.